We have been working on the house for what seems like forever. We have been tackling it room by room and finally it is my little girl’s turn. 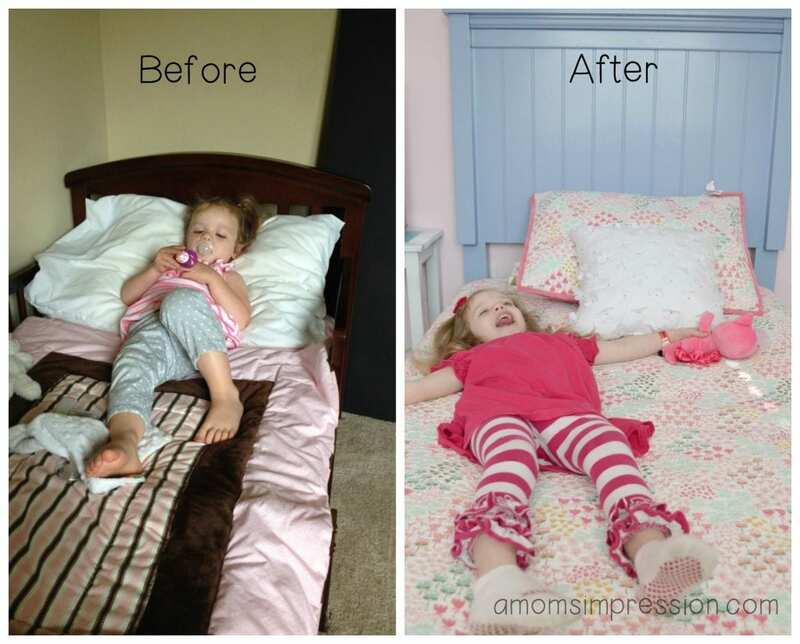 She is way overdue to have a little girl’s room. When she was first born she had to share a room with her big brother so the decor was gender neutral. We moved about 2 1/2 years ago and it is just now that we have been able to focus on her room. My daughter is very girlie. She loves princesses and the color pink. 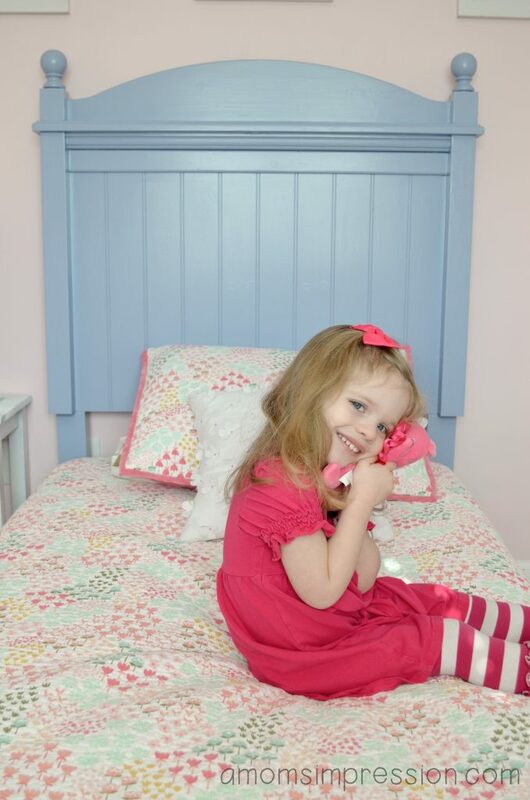 She loves the color pink so much that she told me that everything in her room must be pink. While I am also a huge fan of the color, there was no way I was going to agree to that. There had to be a compromise. 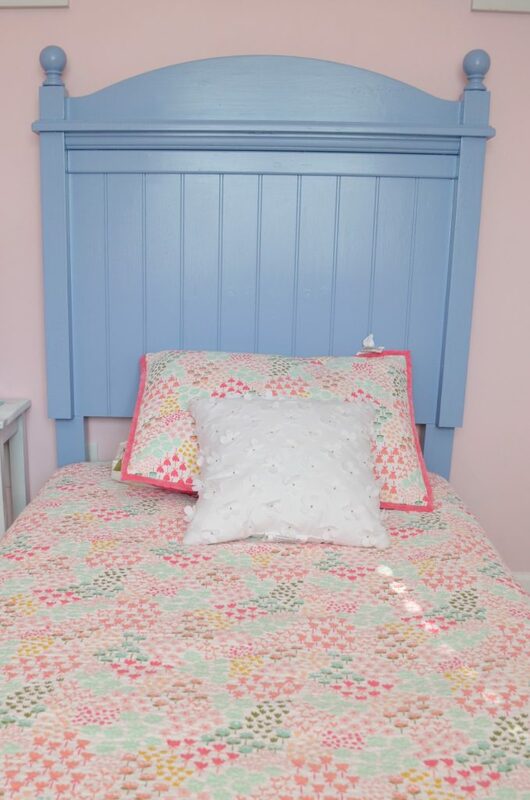 So, we ended up going to Ace Hardware to find a paint color that would complement her girlie side, yet bring a little balance to the overly pink room. This month we are participating in the Ace Hardware “31 Days of Color” campaign. Our color is a grey/blue hue with a hint of purple called Stainless Steel that worked perfectly! 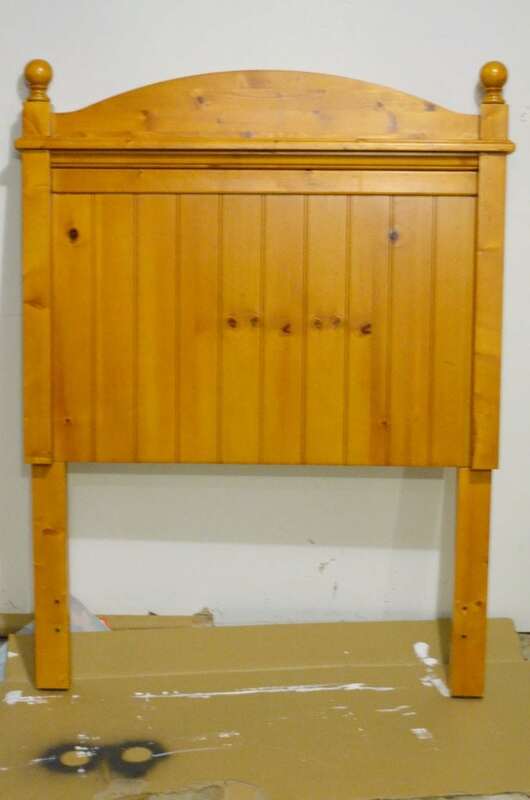 We found a great headboard for Caroline’s room on Craigslist but it was an oak color that wouldn’t match her room. We decided that the Stainless Steel would be perfect, balancing out the room and adding a bit of the sophistication that it desperately needed. 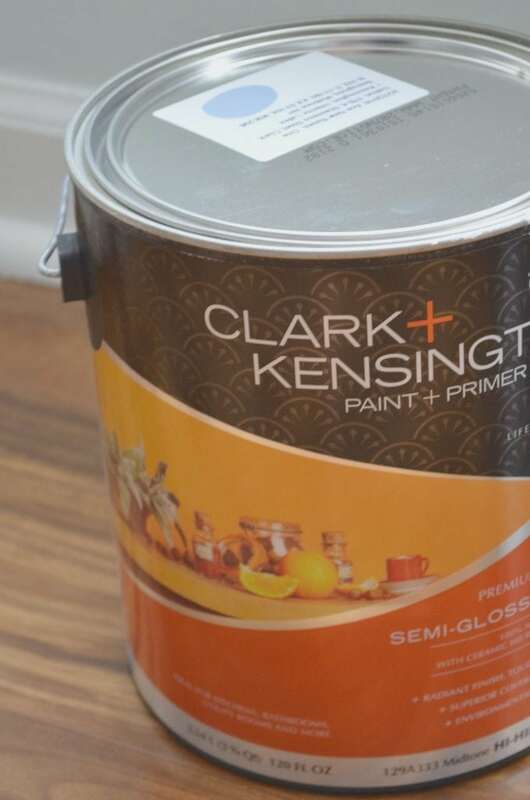 We love this paint from Clark + Kensington because it is paint and primer all in one. We used 2 coats of paint and it was finished, we didn’t need to prime it! 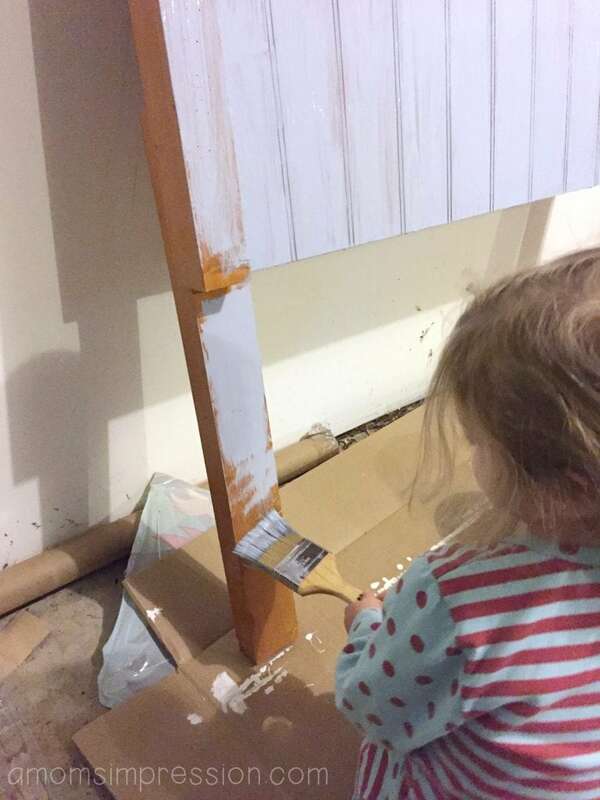 Caroline insisted on helping paint her bed and since she has waited so long for this, we let her help us! We are very excited to see how well it all turned out. 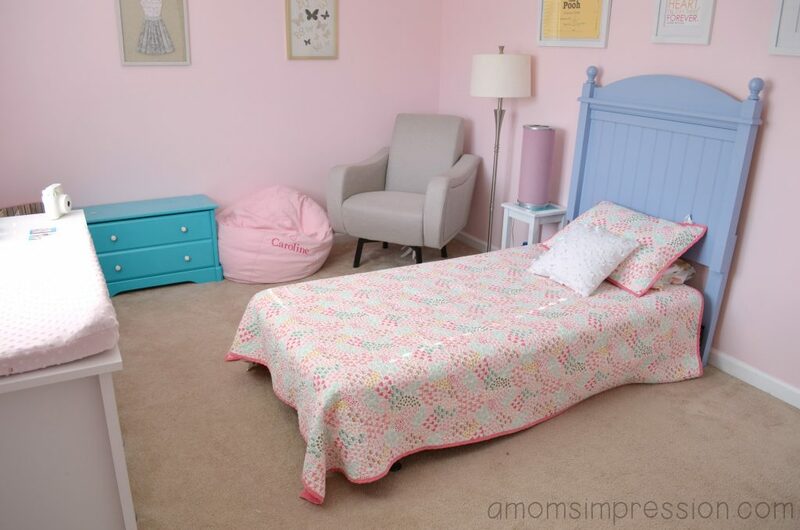 I know that once we add a boxspring to the bed it will look even more polished but Caroline isn’t quite ready for that yet; she has rolled out of her big girl bed a couple of times already. I think in a few months we will add a cute bedskirt and her box spring to make it look even more grown up! 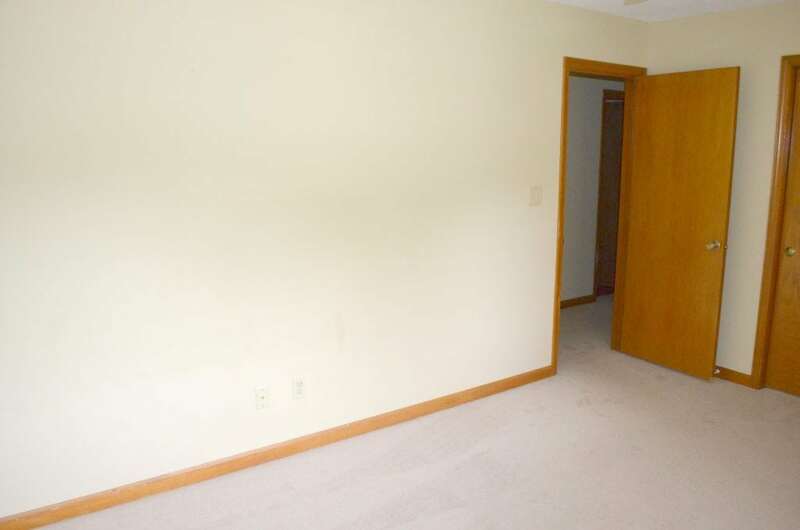 We don’t have a picture of the bedroom from this angle before we painted but you can see that we have done a lot of work. We painted the walls, trim, and doors. It really brightened the room up. She is all grown up now; excuse me while I go cry in the corner. Time is flying by but I am so happy that she now has a special place of her very own! Do you need some inspiration to get some color up on your walls and furniture? Be sure to visit Ace Hardware’s online Paint Studio where they’ll be uncovering the Color of The Day each day in March. Every day there will be a new color featured and used in a project just like this one. While you are there, be sure to enter the 31 Days of Color sweepstakes for the chance to win a $10,000 paint makeover and daily gift cards!